I’m getting a little crush on my Essential Pepin cookbook. It’s full of great stuff, and some weird stuff, too, but I like weird. Well, only to a certain degree–I’m consciously avoiding the section titled: Charcuterie and Offal. I’ll try weird but I’m not eating pituitary glands (sweetbreads) or intestines, and I’m not making my own sausage. I think I’m permanently scarred after reading Upton Sinclair’s novel The Jungle in the tenth grade. Rubber boots and fingernails and hair ground into sausage? Eww. I don’t want to know what goes into sausage; I don’t think my nerves could take it. Thanks a lot, Upton. Keep the muckraking to yourself, buddy. I don’t wanna know. I’ve been working my way through the cookbook, marking things I want to try, and this soup was one of them. I chose it mainly because it sounded weird. Celery and noodle soup? That’s weird, right? But I like celery. I like noodles. And in the winter, I will tolerate soup. I can’t say I like it, but I certainly don’t loathe it, like my friend Karen’s mom does. Nor do I feel shame in eating it, like my sister’s college roommate, Erica. Erica refused to eat soup. I’ll never forget the horror on her face when she saw me tucking into a bowl of chicken noodle. Quirky girl, that Erica. She also showed up in high heels for a camping trip, but that’s another story. A few days ago, it was definitely soup weather. The wind was blowing like nobody’s business, and on a blustery day, soup is a good thing. I took out my Essential Pepin and perused the soup section, settling on this one. However, I knew I was going to have to tinker with it because I didn’t have vermicelli noodles–or any noodle other than penne for that matter–and I had a scant two cups of celery on hand. I like that in a chef; his recipes aren’t too precious. Tinkering is fair game. Good thing, because no way did I have any intention of braving the grocery store in that wind. Meteorologists in Boulder clocked it at 88 miles an hour at one point; I was staying indoors, people. Thus, I totally bastardized tinkered with the recipe. The original recipe appears first, and I follow it with the modifications I made. The soup was simplicity itself. Pepin says it’s the soup he craves when he gets a cold, and I can see why. The flavors were clean and subtle and comforting. This isn’t a soup to eat when you want a wallop of flavor; make Mulligitawny or gazpacho if you want wallop. I ate a bowl for lunch and then served it again at dinner, topped with some rustic homemade croutons. Oh boy–let me tell you, you want to add the croutons. 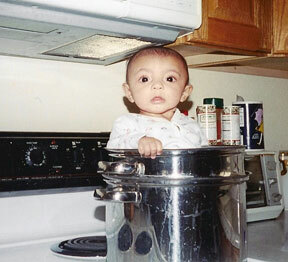 They took the soup to an entirely different level. My husband, who is indifferent toward celery, actually raved about his crouton-topped bowl. Croutons are magic. 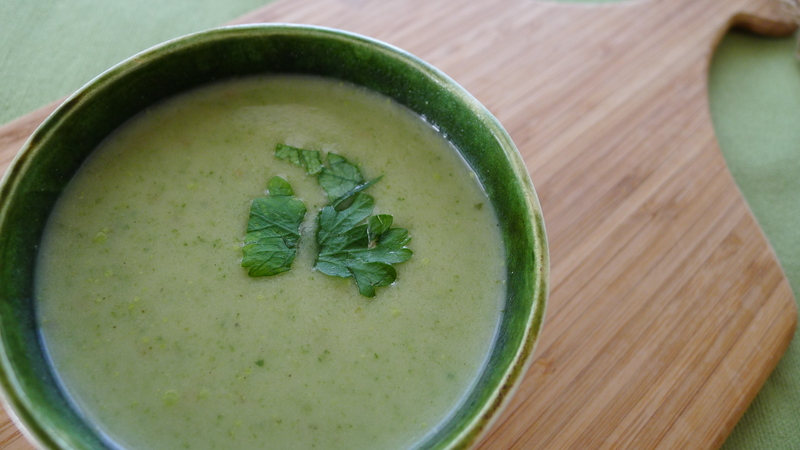 If it’s blustery outside or you’re feeling a little blue, give this soup a try. If you have leftover veggies on hand, more the better. Nothing improves my mood like putting leftover things to good use, which Erica would probably call “poor.” I call it smart. Melt the butter and oil in a large pot. Add celery, onion and scallion and saute over medium heat until softened, about 2 minutes. Add the water, salt, pepper and thyme and bring to a boil. Reduce the heat, cover and simmer for 10 minutes or until the vegetables are soft. 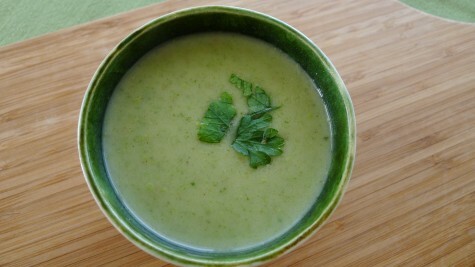 Using an immersion blender or a traditional blender, puree the soup. Return to the pot if necessary and add the noodles. Bring to a boil and simmer for 3-4 minutes or until the noodles are cooked. Add the milk and stir to heat through. If desired, put a little knob of butter in the bottom of each soup bowl and pour hot soup over. Melt the butter in a large stockpot. Add the celery and onion and cook over medium heat until softened, about 3 minutes. Add the garlic; cook 30 seconds. Add the water, stock, potato, spinach, salt, pepper and thyme and bring to a boil. Reduce heat, cover, and simmer for 20 minutes or until the potato can be easily pierced with a knife. Blend soup. Reheat and let simmer another 5 or 10 minutes or until slightly thickened. Add cream. Garnish with parsley and, if you are smart, homemade croutons. Preheat the oven to 375 degrees. Place bread on a large cookie sheet; drizzle with oil or melted butter, tossing the cubes around to coat. Spread cubes in an even layer and sprinkle seasonings over. Bake for about 8 minutes or until brown and crisp. *I know Pepin’s recipe called for milk, but I was hesitant to add milk to hot soup, fearing the milk would curdle. Plus, I knew I’d be reheating this soup for supper, and cream is much more stable than milk when re-heating. If, as I did, you throw a potato in the soup, it adds creaminess, allowing you to add only a small amount of cream with satisfying results. Wow, incredible weblog layout! How lengthy have you ever been running a blog for? you made running a blog look easy. The overall look of your web site is fantastic, let alone the content material! I like the helpful info you supply in your articles. I will bookmark your blog and take a look at again here regularly. I’m somewhat sure I’ll be informed a lot of new stuff proper right here! Best of luck for the following! Great publish, very informative. I wonder why the opposite experts of this sector do not realize this. You must proceed your writing. I am sure, you have a great readers’ base already!|What’s Taking place i’m new to this, I stumbled upon this I’ve found It absolutely helpful and it has helped me out loads. I hope to contribute & aid other users like its aided me. Good job. Woah this weblog is excellent i like reading your articles. Keep up the good paintings! You know, many persons are looking around for this info, you could help them greatly. Nice post. I was checking constantly this weblog and I’m inspired! Extremely useful info specially the final phase :) I deal with such info a lot. I used to be looking for this certain information for a long time. Thank you and best of luck. Hi there, just became aware of your blog thru Google, and found that it is really informative. I am going to watch out for brussels. I will be grateful if you continue this in future. Many other people might be benefited from your writing. Cheers! Helpful info. Lucky me I found your site by chance, and I’m shocked why this coincidence didn’t took place in advance! I bookmarked it. Somebody essentially lend a hand to make seriously posts I would state. That is the first time I frequented your web page and thus far? I surprised with the research you made to create this actual publish extraordinary. Magnificent process! Tremendous things here. I’m very happy to look your article. Thanks a lot and I’m looking ahead to touch you. Will you kindly drop me a mail? Wonderful site. Lots of helpful info here. I am sending it to some friends ans also sharing in delicious. And certainly, thanks to your effort! I used to be suggested this website by way of my cousin. I am not sure whether or not this publish is written by him as no one else recognise such unique approximately my trouble. You are wonderful! Thank you! Thank you for the auspicious writeup. It in truth was once a amusement account it. Look advanced to more introduced agreeable from you! However, how could we communicate? Thanks for the good writeup. It if truth be told used to be a amusement account it. Look complicated to far added agreeable from you! However, how can we keep in touch? Excellent publish, very informative. I’m wondering why the other specialists of this sector do not understand this. You should continue your writing. I’m sure, you have a huge readers’ base already!|What’s Happening i am new to this, I stumbled upon this I have found It absolutely useful and it has aided me out loads. I hope to give a contribution & aid different customers like its helped me. Great job. Hi, i feel that i saw you visited my weblog so i came to return the prefer?.I’m trying to to find things to improve my site!I guess its adequate to make use of a few of your ideas!! That is only of course if you decide to play your headphones on full blast, if you lower the volume of the sound then this issue is less a problem, it is only at high volume that you may have a problem with the issue of sound leakage.The beats wireless headphones while on are also extremely comfortable, you hardly notice that you are wearing them. The headphones come with various accessories and included the batteries that are required for them to work, make sure you keep spare batteries just in case you run out, as obviously what is the point in having a pair of headphones if you travelling and do not have any batteries for them to work, this can be a problem if you don take spares or the ability to recharge your existing batteries.Overall from this product we have seen these beats by dre studio headphones are a very high quality in not only design but also their performance they put out, they really do set a benchmark when it comes to music and the headphone industry. Dr Dre Monster Beats headphones gets a thumbs up from us.Exactly how Preferred Monster Beats by Dr. Dre Studio Is actuallyStudio, a sort of Monster earphone which has certainly high coverage, whereby can you notice? In sports activities channel and amusement channel, Monster studio headphones is very well-defined. Earlier Entire planet Cup, any time athletes from all of from the nations around the world from the planet got from the chartering, Monster Beats by Dr. Dre Studio earphones were almost their necks. Basketball celeb Kobe is a person associated with Monster Beats by Dr. Dre Studio. I don’t even know the way I finished up right here, however I assumed this publish was once good. I do not understand who you might be however certainly you’re going to a well-known blogger in case you aren’t already. Cheers! Hiya very cool blog!! Guy .. Excellent .. Amazing .. I’ll bookmark your site and take the feeds additionally?I am satisfied to seek out so many helpful info right here within the put up, we’d like develop extra techniques in this regard, thanks for sharing. . . . . . I have read several excellent stuff here. Definitely worth bookmarking for revisiting. I wonder how a lot attempt you set to make this kind of wonderful informative web site. I’m now not certain where you’re getting your info, but great topic. I must spend some time learning much more or figuring out more. Thanks for excellent information I used to be on the lookout for this info for my mission. Its such as you read my thoughts! You seem to grasp a lot about this, like you wrote the e-book in it or something. I believe that you simply could do with some percent to power the message home a bit, but instead of that, that is magnificent blog. A fantastic read. I’ll definitely be back. I am not certain the place you’re getting your info, however good topic. I must spend some time learning much more or understanding more. Thanks for magnificent information I used to be searching for this info for my mission. Thank you, I have just been looking for information approximately this subject for ages and yours is the greatest I’ve discovered so far. But, what concerning the conclusion? Are you certain about the supply?|What i don’t understood is if truth be told how you are now not actually a lot more neatly-preferred than you may be right now. You are so intelligent. SKLbeI Thank you for your post.Really thank you! Really Cool. I will right away grab your rss as I can’t in finding your e-mail subscription link or newsletter service. Do you have any? Please allow me realize so that I could subscribe. Thanks. Whats up very nice blog!! Guy .. Excellent .. Amazing .. I’ll bookmark your blog and take the feeds also?I’m happy to find so many helpful information here in the publish, we want develop extra strategies on this regard, thanks for sharing. . . . . . I do trust all of the ideas you’ve offered in your post. They are really convincing and will certainly work. Still, the posts are very short for novices. May you please extend them a little from next time? Thanks for the post. You can definitely see your enthusiasm in the paintings you write. The world hopes for more passionate writers like you who are not afraid to say how they believe. Always go after your heart. Fantastic issues altogether, you simply received a logo new reader. What would you suggest in regards to your submit that you made some days ago? Any positive? Hi, of course this article is really nice and I have learned lot of things from it regarding blogging. thanks. I beloved as much as you will receive performed right here. The comic strip is tasteful, your authored material stylish. nonetheless, you command get bought an edginess over that you want be turning in the following. ill certainly come more until now once more as precisely the similar nearly a lot continuously within case you protect this increase. I loved up to you’ll obtain carried out proper here. The sketch is tasteful, your authored subject matter stylish. nevertheless, you command get bought an nervousness over that you want be handing over the following. ill surely come further in the past once more since exactly the same nearly a lot regularly inside of case you shield this increase. hey there and thanks on your information ? I have certainly picked up anything new from proper here. I did however expertise a few technical points using this website, as I experienced to reload the website lots of instances prior to I may just get it to load properly. I were puzzling over in case your hosting is OK? Now not that I’m complaining, however sluggish loading cases instances will very frequently affect your placement in google and can harm your high-quality rating if advertising and marketing with Adwords. Anyway I am including this RSS to my e-mail and could look out for much more of your respective exciting content. Make sure you replace this once more very soon.. Thank you for another excellent article. The place else may just anybody get that kind of info in such an ideal way of writing? I have a presentation subsequent week, and I am at the search for such info. A person essentially lend a hand to make critically posts I might state. This is the first time I frequented your web page and thus far? I surprised with the research you made to make this particular put up incredible. Magnificent process! Next post: Guest Post: Miss D.